Nick Turton – making his return to Khalsa. Three in, one out at the Aspray Arena this week. First, it is important to acknowledge the departure of midfielder Lee Chilton who is heading to Evostik Southern Premier League Central Division outfit Alvechurch. Lee has been a huge part in Khalsa’s season so far with 18 goals and many more assists. Thank you, Chilly, for everything you have done during your time at the club. Arriving at Khalsa are three new faces. Well, two new and one old (if charming). 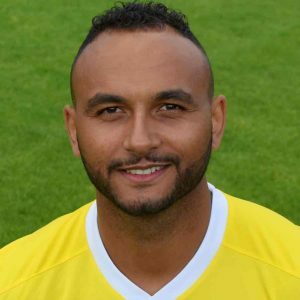 First, a warm welcome return to Sporting Khalsa for combative striker Nick Turton who arrives from Worcester City. Nick and our defenders recently had a feisty reunion during our 1-0 win at Worcester and we suspect they will be glad to have him back on our side. Second, Sean Williams arrives from Quorn. Formerly with Willenhall Town, Oldbury Athletic, Cradley Town, Bromsgrove Sporting, Studley and Highgate United, the wideman is well known to Khalsa, scoring and being sent off in the last fixture between the two sides. Third, Yannick Gomes arrives from Kidderminster Harriers Academy. The midfielder has previously turned out for Rugby Town and Tividale as well as having a very short spell at the start of this season with Wolves Sporting Community. We wish our new arrivals well at the Aspray Arena.